Trend Micro shared the above stats with me as part of my participation in the year long Digital Joneses family study. I have learned so much about internet safety in the past months but every time they share statistics with me I am shocked by one or two of them. This month was no exception. 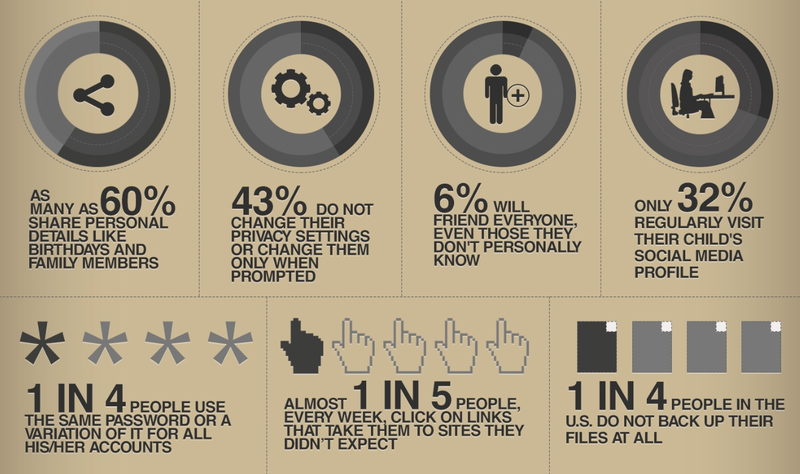 I couldn’t believe that 6% of people friend everyone that asks to be their friend on Facebook, even if they don’t know them! When I think about everything people post on their personal Facebook pages including where they are, phone numbers, addresses, and pictures the amount of private information that our “friends” have access to could be dangerous. The person you “friend” could be waiting for you to announce a vacation so they can find out when the perfect time to rob your home is. Another issue I have with Facebook are the pages that say you have to “friend” them to view the information on their page. You don’t know who is behind the page and I don’t think there is any reason you’d have to give them access to your personal information to join the page. 1) Manage your online accounts with secure passwords. They suggest using a phrase of random words that you can remember, instead of paraphrases or single words. Having passwords of at least ten to twelve characters is a good start and they recommend more characters for passwords that protect sensitive sites (like banks). You should also avoid using the same passwords for multiple sites, especially if it’s a password that has been cracked by hackers before. 2) Know and use the privacy settings of your social networking accounts and mobile apps. The security settings are consistently changing and new ones are being added on a regular basis so it’s important to pay attention to information that social networks share with their members and update your privacy settings accordingly. 3) Regularly back up your data. Computers contain documents and pictures that hold valuable content and memories. Backing up your data ensures that none of that is lost. 4) Install a security software in all your devices.Trend Micro goes to great lengths to identify online threats and make it easy for you to protect yourself and your family from them with Trend Micro™ Titanium™ Security. Titanium is easy-to-use, yet comprehensive protection for what you do online every day – emailing, socializing, surfing the web — and it won’t pester you with alerts and pop-ups. Reblogged this on TECHNOLOGIES CUTTING EDGE.